Albert Babcock was born on February 17, 1840, in St. Albans, Franklin County or Alburg, Grand Isle County, Vermont, the son of Vermont natives Hamilton Babcock (b. 1806) and Sophronia Wheeler (1806-1898). Hamilton and Sophronia were married in 1828 in Alburg, Vermont and were living in Alburg in 1830 and 1840. The family moved to Burr Bay (? ), New York around 1846, and then on to Iowa. By 1850 the family was living in District 13, Wapello County, Iowa where Albert attended school with his siblings and his father worked as a carpenter. Hamilton reportedly died in Fayette County, Iowa, and Sophronia brought her children to Ottawa County, Michigan sometime afterwards. In 1860 Sophronia was working as a domestic and living with her three younger children in Tallmadge, Ottawa County (Albert was not with the family). Albert was apparently well-acquainted with Hiram Bateman also living in Lamont, Ottawa County and who would join Company I in the spring of 1861. According to Hiram Bateman, who had been a neighbor in Lamont and who had enlisted in Company I and by the winter of 1862 was a hospital attendant in the 3rd Michigan infantry regimental hospital, Albert “was for many months an invalid in the regimental hospital . . . and that he was under my especial care as nurse up to the time of his discharge from the service.” Albert was discharged for chronic rheumatism on June 15, 1862, at Camp Lincoln, near Fair Oaks, Virginia. Albert was working as a farmer in Waukesha, Wisconsin when he registered for the draft in the summer of 1863; his prior service duly noted in the record. He married Emily Tracy (1835-1918) on November 11, 1863, in Grand Rapids; they had at least three children: Hamilton (b. 1865), Louise H. (b. 1872) and Albert P. (b. 1873). By 1870 Albert was working in a mill and living with his wife and son in Ravenna, Muskegon County. His mother, Sophronia, or Sophrona, was living as the head of the household in Tallmadge, Ottawa County; also living with her were two of Albert’s brothers: lumber manufacturer George Babcock, (b. 1839), who owned some $5000 worth of real estate and William Babcock (b. 1846). By 1877 Albert had returned to Ottawa County and was living in Lamont, probably working in the lumber industry, and probably involved with the newly organized Reform Club of Lamont. 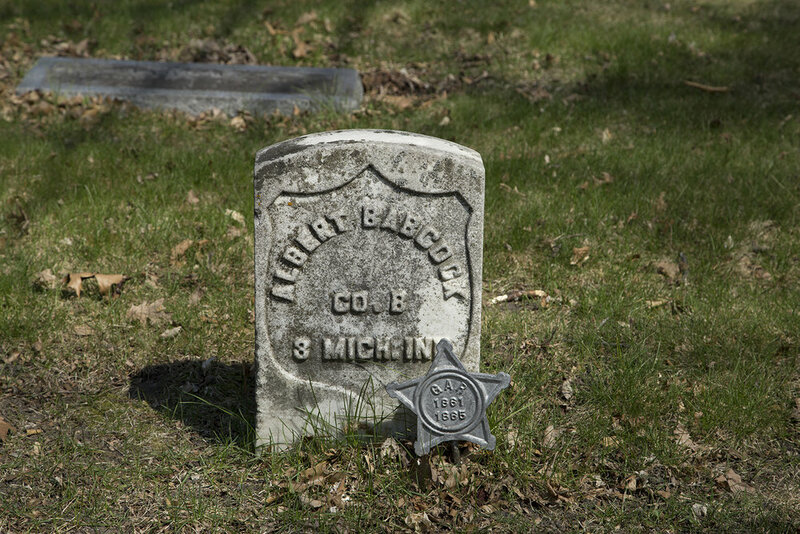 Albert joined the Old 3rd Michigan Infantry Association in 1878, and was still living in Lamont in 1880 with his family and apparently working as an engineer. He was still living in Lamont in 1885, but by 1890 he was living at 148 Thomas Street in Grand Rapids (next door lived Wilbur Scott, another former member of the Old 3rd Michigan infantry), and in 1907 at 162 Thomas Street. Albert lived in Grand Rapids for some 30 years, and for 14 years worked as a street inspector. He was a member of Grand Army of the Republic Champlin Post No. 29 in Grand Rapids; and he received a pension (no. 369,169), drawing $25.00 per month by the end of 1917. Albert died of angina pectoris on Wednesday October 27, 1915, at his home on West Leonard Street in Grand Rapids, and the funeral services were held at his home at 2:00 p.m. on Saturday. Albert was buried on October 30 in Fulton cemetery: block 7, lot no. 25. His widow applied for and received a pension (no. 802252), and was drawing $20 per month by 1916.